After you have obtained your level 1(L1) data, the next step in data analysis is to use your calibrator and target observations to produce calibrated visibilities, or level 2 (L2) data. The visibility that PTI measures on an astronomical object (Vm) is the product of the true object (Vt) visibility and a factor, called the system visibility (Vs), which represents the loss of coherence due to instrumental and atmospheric factors: Vm = Vt * Vs. In order to obtain the true object visibility, the system visibility must be estimated. The system visibility can be estimated using observations of stars of known size, and thus of known true visibility; or more typically using observations of unresolved stars, which have a true visibility of 1.0 and directly provide an estimate of the system visibility (Vm = Vs). Once the system visibility has been estimated, the calibrated or true object visibility is simply obtained as: Vt = Vm/Vs. (Note: the Keck Interferometer data reduction method uses visibility amplitude squared, rather than visibility amplitude, as the basic observable; a distinction with no consequences to the present discussion). In general the system visibility is an instantaneous quantity, and may depend on other factors such as the object location in the sky (e.g. as the zenith angle increases, the atmospheric effects may become more severe) and the instrument configuration (e.g. integration time). 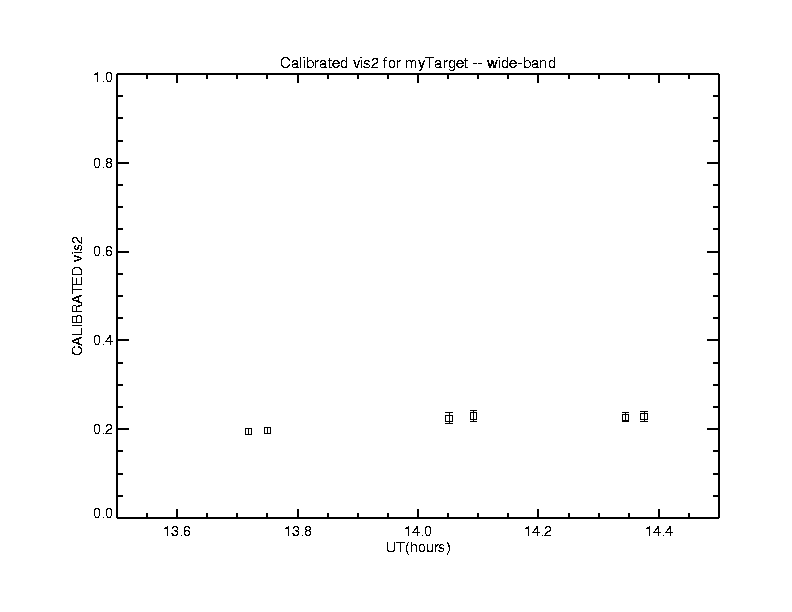 Insuring that target and calibrators can be observed under the same instrument configuration (e.g. have similar magnitudes for the different sub-systems) and are close in the sky, is part of the planning process. Ideally, the science target should be brackted by calibrators, but this is not always the case. Your L1 data contains all that is needed to perform the calibration, and a variery of methods can be considered for estimating and applying the system visibility to produce calibrated data. Although data calibration is not performed at the NExScI, we make available two software packages, wbCalib (for calibration of wide-band data) and nbCalib (for calibration of narrow-band data), which which greatly automate and simplify this process. The Calib packages take as input a L1 data file and a calibration script detailing which objects are targets and which are calibrators, and their estimated sizes, and produces one file of ASCII output containing the calibrated data, plus other very useful ancillary data, such as the spatial frequencies (u and v) corresponding to each calibrated visibility. The Calib packages also have a variety of options which apply corrections for potentially significant effects such as unbalanced fluxes between the two interferometer arms, or optical path jitter. Please refer to the help pages above for details on how to use those programs. Both packages can be downloaded from the NExScI software download page . The first step in calibrating your data is identifying relevant calibrators for your target. When selecting data from the PTI archive, you can automatically retrieve the data from sources marked as calibrators for that target. Note that the calibrator designation comes from either the original experiment plan or from the source's proximity to the target in time and on the sky. We strongly recommend verifying the appropriateness of the calibrators before running the Calib programs. You can also use the archive search function to find all observed sources within a given radius around your target source. Plot the system visibility, it should be a smoothly varying function, with an average value between 0.6 and 0.8. The system visibility can change with time, for example it may decrease as the zenith angle increases, but abrupt changes are usually indicative of an instrument problem. In that case, inspect your data and observing logs. Note that if the calibrators are not unresolved, it is crucial to provide good estimates of their sizes in order to obtain a good estimate of the system visibility. A common way to verify this is to treat a calibrator as a target, and verify that you get the expected value of the calibrated visibilities (for example 1.0 for an unresolved calibrator). If not, then the calibrator sizes may need to be corrected. Once the visibilities have been calibrated as outlined above, your PTI data is ready for astrophysical interpretation. Typically this is done by assuming a simple target brightness (e.g. a binary, a uniform disk, a Gaussian disk, a ring, or a combination of those), deriving the corresponding visibility function, and fitting this function to the calibrated visibilities to extract some of the parameters that define the assumed brightness (e.g. binary separation, orientation, flux ratio; uniform disk or Gaussian diameters etc). Another typical approach is to add the visibilities to the global fitting of a more complex and physical model to a dataset which might also include spectro-photometric data, for example. Clearly the above data shows that the source myTarget is clearly resolved, as its raw visibilities are much lower than those of the two calibrators used (HD157546 and HD174596). Note that the getCal package contains a function that facilitates the generation of properly formatted calibration scripts. Please pay particular attention to your choice of calibrator angular sizes and errors, as those will directly impact the resulting calibrated visibilities. While for observation planning it is acceptable to provide only approximate calibrator angular sizes, it is crucial to provide accurate estimates with realistic errors in the calibration step. Recall that in addition to providing stellar size estimates based on standard lookup tables for normal stars, the getCal package also contains routines to provide better estimates by fitting spectro-photometric data , see the getCal documentation for details. for wbCalib only; PTI utilizes a spatial filter on the spectrally dispersed side of the beam combiner and these data are generally of higher quality than than unfiltered WL side. The jitter correction is applied to both targets and calibrators, we recommend using the default coeffient. See the PTI visibility estimation paper for more details. In many cases, the ratio measurments are unreliable and should only be applied if you have verified their quality. Suppose you know that the target above is an evolved star surrounded by a near-infrared emitting dust shell, and that you have independent evidence that the central star is unresolved and contributes 30% of the total K-band flux. You may then want to obtain a characteristic size for the dust shell being resolved by PTI. 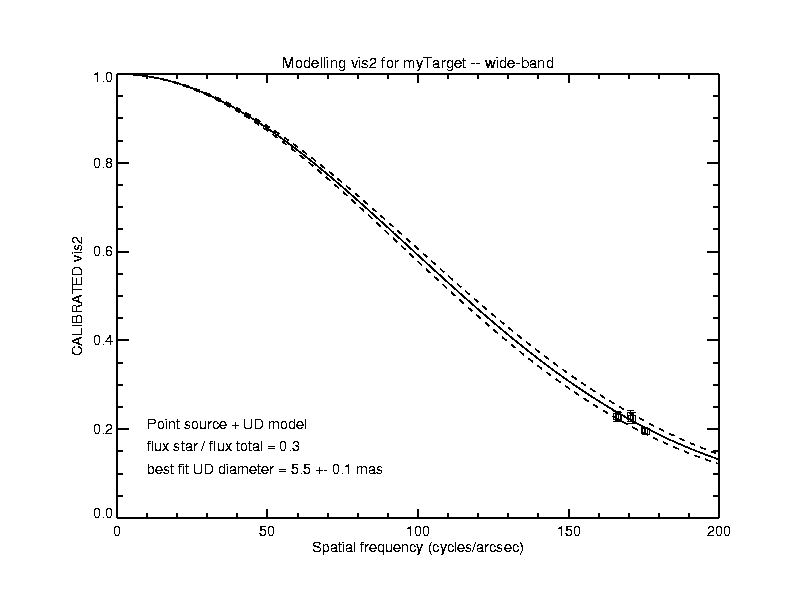 Given what you know about the target, a reasonable model for this source would then consist of a point source plus an extanded component, represented for example by an uniform brightness. The plot below shows the model (and uncertainties) that would result from fitting such a model to the calibrated visbilities.